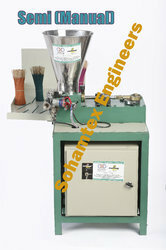 By utilizing skills of our experienced professionals, we are manufacturing, exporting, & supplying a comprehensive assortment of Semi Automatic Incense Making Machine. This unique machine is manufactured by professionals employing pristine-grade material and leading-edge technology. Owing to its quality features like strong design, excellent performance and corrosion resistance, this product is widely acknowledged by our clients from every nook & corner of the world. The offered product is made available in a range of customized options. By utilizing skills of our dexterous workforce, we are offering a comprehensive assortment of Agarbatti Incense Making Machine. Our professionals manufacture this machine by employing optimum quality raw material and sophisticated technology in adherence to the set industry standards. Owing to features like precise design, resistant to corrosion and easy installation, our offered product has been able to earn a lot of popularity in the market. 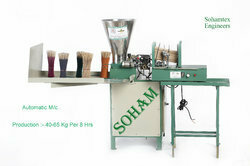 Moreover, our valuable clients can avail this machine from us at market leading prices. 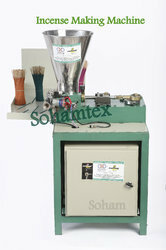 We bring forth an extensive range of Incense Making Machine. Owing to features like durability and easy installation, the offered range is extensively demanded in various industries. A team of our skilled professionals, with a wide experience manufacture the offered machines using high grade raw material and modish technology. The offered machines are available with us in various sizes, shapes, designs and other related specifications. Meeting the demands of customers as a manufacturer, exporter and supplier, we are engaged in offering Incense Stick Making Machine. 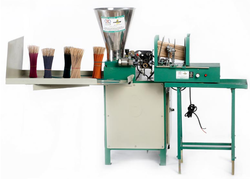 Our professional manufactures this machine by employing optimum quality raw material and sophisticated technology in adherence to the set industry standards. Owing to features like precise design, resistant to corrosion and easy installation, our offered product has been able to earn a lot of popularity in the market. We are manufacturer, supplier and exporter of Agarbatti Incense Machine also known as Agarbatti Making Machine, incense machine, Agarbatti machine. We can also supply auto feeding system for this machine. Under precious guidance of our skilled professionals, we are engaged in offering a wide range of Semi Automatic Incense Machine. 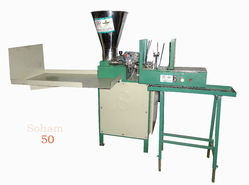 Owing to its remarkable quality, the offered machines are highly applauded by our clients. Provided range is precisely designed by our expert professionals using excellent quality material and advanced technology. Moreover, we check the offered machines on various quality parameters to provide a flawless dispatch from our end. Length of incense : 8" to 12"
Based on the skills of our adroit professionals and creative workers, we bring forth an extensive range of Semi Automatic Incense Making Machine. Owing to features like dimensional accuracy, durability and easy installation, the offered machines are extensively demanded in the market. A team of our adept professionals with hard-earned experience manufacture the offered range using high grade raw material and the latest technology. Length of stick 11", 12", 10", 9", 8"
Free:Contacts of raw material supplier, material mixing formula, machine operating, general maintenance of machine. Free: Technical service support on telephone after sales. Echo Semi Nano Feeder 200 Sticks machine. Production: 60-80 kg. /8 Hr. (Depends on stick Quality)Soundless Gearbox with hardened gears & grounded Shafts. Air-cooled Bowl housing. Problem less DC Motor, DC Gear motor, and Sensor. (Compare to others)Auto stop when material was finished, raw stick finish and stick not pass from die. 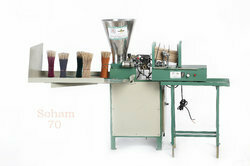 Looking for Incense Making Machine ?